The new Gillig 3900-series buses will feature upgrades for both riders and drivers, and a new paint scheme. TriMet is preparing to roll out dozens of new buses with a new paint scheme. The new buses will both increase the number of buses in TriMet's fleet to 712 and reduce their average age to about five years. The new buses are part of the greatest expansion of TriMet's bus service in the agencies history, which is being largely funded by increases in the regional payoll tax approved by TriMet's board of directors and TriMet's share of new statewide payroll tax for transit service approved by the 2017 Oregon Legislature in Keep Oregon Moving Act. • "Porch lights" illuminate exterior entry and exit points. • Additional exterior lighting near the doors for improved visibility in low light. • Upgraded speakers for crisper operator and stop announcements. • Sound-reducing material to help muffle mechanical noise. • Enhanced skid plates on wheelchair ramps for added traction. The new buses also feature a safety panel around the operator's seat that includes an adjustable window the driver can open or close, based on their preferred level of security. TriMet tested the panels and took feedback from operators for more than a year before moving forward with plans to install the panels on all new buses. Six buses already have safety panels, and nearly 500 buses in the fleet will be retrofitted with them over the next five years. They new busus will also debut a new look for TriMet. They will have a base of classic blue with a splash of bold, orange striping on either side. 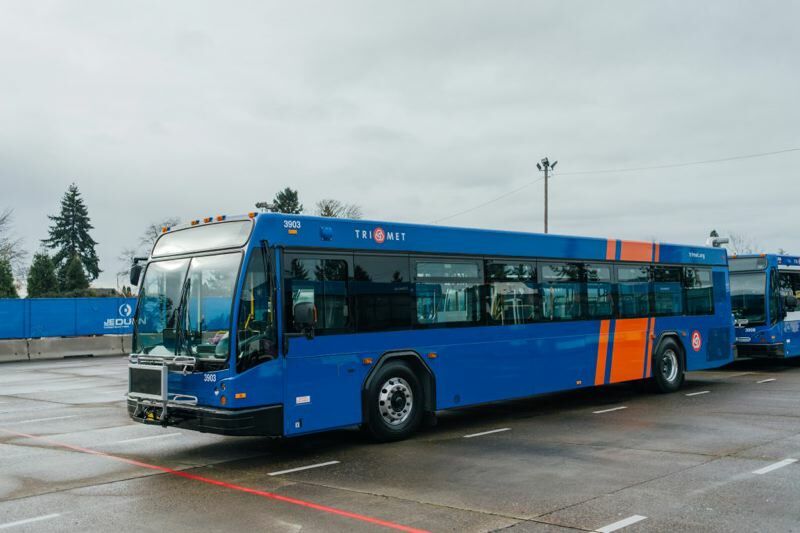 According to TriMet, the new paint scheme "reflects TriMet's nearly 50-year history in the community, while drawing on some current trends in the transit industry. Solid colors are popular, and we chose blue as the base because it's considered soothing. As for the orange? 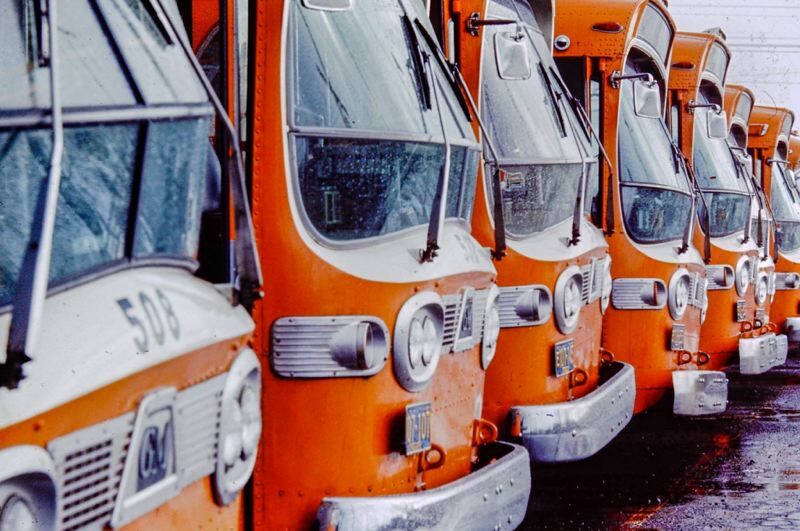 It's a throwback to the color of TriMet's original bus fleet." Some of the new buses will replace older vehicles that have been in service for decades. TriMet has already started retiring the 48 buses that made up our 2200 and 2300 series. They were added to the fleet in 1999 and feature TriMet's classic Maroon logo and striped paint design. TriMet says that on average, those buses have charted nearly 900,000 miles each, and calls their longevity "a testament to our dedicated maintenance staff, which works tirelessly to keep our vehicles operating at optimal safety and performance levels." TriMet says the new buses will help meet the needs of the service expansion launched in the fall of 2018. Another round of service improvements is scheduled for March. They include an extension of Line 24-Fremont across the Fremont Bridge to Northwest and Southwest Portland, and a new bus line to serve Clackamas County. To learn more, visit www.rimet.org/plan.